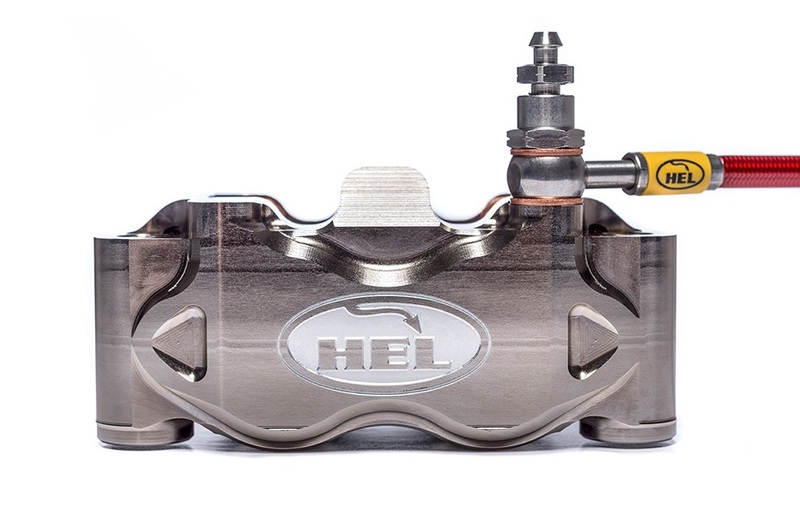 HEL Performance calipers are offered in a GP inspired Nickel plating. This coating protects the caliper from the elements and enhance the bike. Our calipers have retained pins – they don’t have a pin going all the way through so to change the pads you remove the caliper bolts, slide the caliper out, remove and replace the pads and reattach the caliper to the forks. This means that the calipers can be blown out with air before reinstalling to make sure the inner surfaces are clean. We have used our integral bleed banjo bolts in the design which means less material is required in the caliper and that the bleed point is at the highest point. Our calipers also feature a complete fluid path. This means that there is a complete circuit running through the caliper meaning it is easier to remove air from the system when bleeding. Some calipers only feed from one side but with ours circulating the fluid around the whole caliper bleeding is simplified. 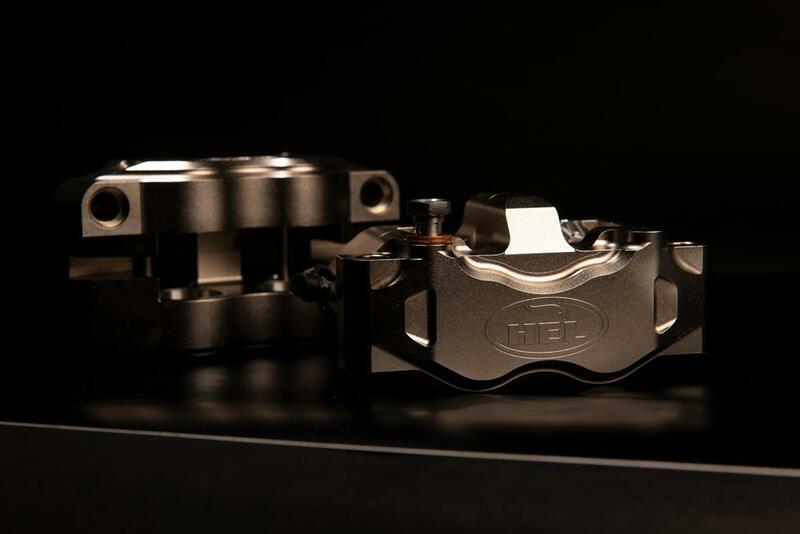 Our calipers weigh in at a lightweight 759 grams each without pads and feature stainless steel pistons. 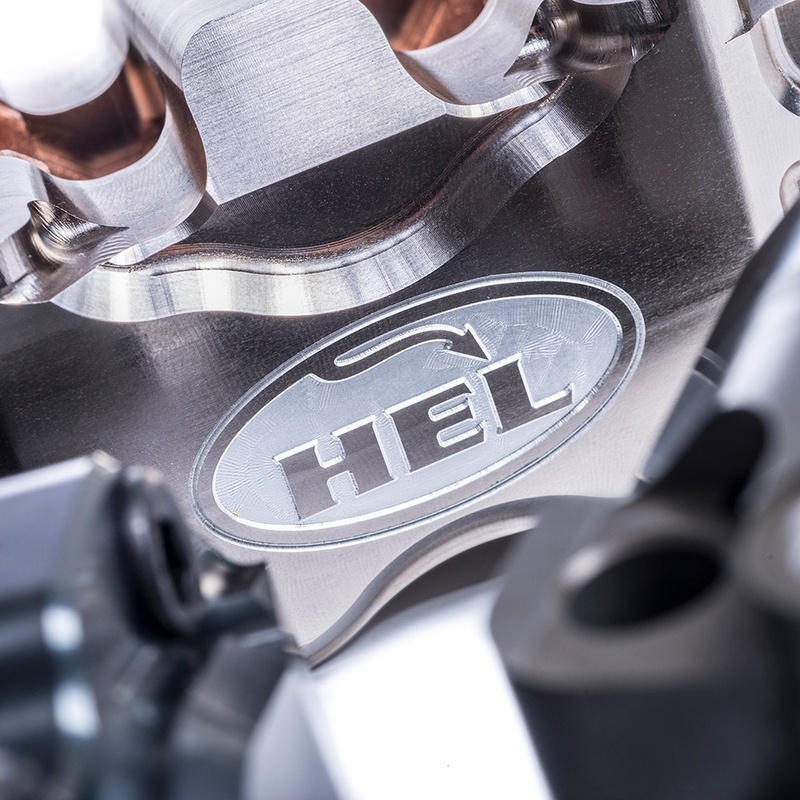 Stainless steel acts as a heat sink drawing the heat generated through braking which means heat takes longer to effect the brake fluid. Brake fluids boil at different temperatures depending on the fluid you use and so retaining heat in the pistons rather than heating up the fluid will enhance braking for longer periods of time – perfect on track. We only manufacture our calipers from solid billets of aluminium. Many mass-produced calipers are forged but this does limit their design. The forgings also need to be machine finished for threads and the internal flow circuit as the forging will not be able to create these details. We offer the very best product we can and CNC from solid 6082-T6 billets. 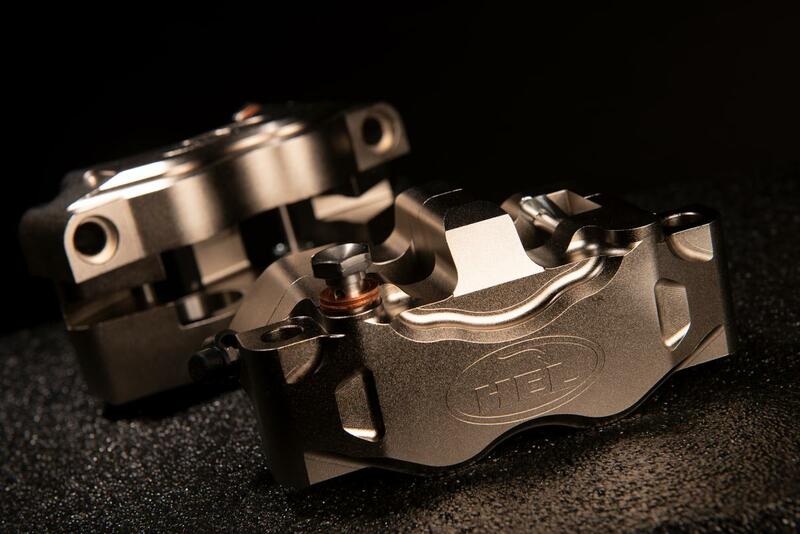 The finish is stunning with every part of the caliper precision machined. Maximising weight saving and minimising material use.Radial mount two piece two pad high performance caliper. 4 pot stainless steel piston (32 mm) caliper design. The Caliper body is machined from solid 6082-T6 aluminium. Radial mounts available in 100mm and 108mm to fit most modern motorcycles. HEL Performance brake pads included. Kit includes instruction manual with all information with reference to fitment, bleeding, maintenance and more.